1.) 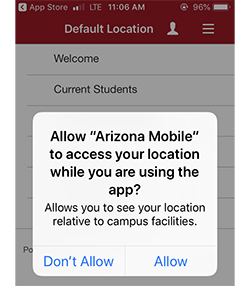 Download the official University of Arizona mobile app – search Arizona mobile. 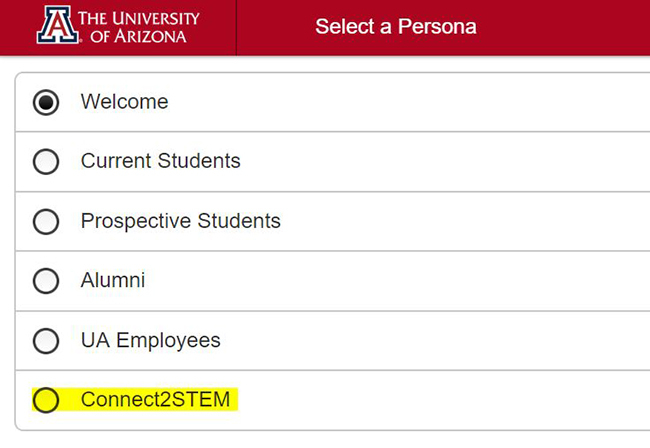 If you already have the UA Arizona mobile app, then just click on the person icon in the top header and change your persona to Connect2STEM. 2.) At the welcome screen, select Connect2STEM. Location Access: You will be prompted to allow the application to access your location. This will assist you when using the Event Map (restrooms, food, exhibitor highlights, etc.). Select Allow when prompted. Notifications: Push notifications (important messages for safety and event updates) will be sent during the event only. Select Allow when prompted. If you have any questions, please email phoenixmed@email.arizona.edu. *To connect to UA guest Wi-Fi, please follow these instructions (PDF). You may also access the app content via mobile web.